Seventy-three-year-old Buddhist spiritual leader had his gallstone removed after falling ill in India. Life is suffering: Tibetan Spiritual Leader His Holiness The Dalai Lama was hospitalized in New Dehli for unknown causes. NEW DELHI –– Surgeons successfully removed a gallstone from the Dalai Lama on Friday, just days after doctors had cleared the Tibetan spiritual leader during a medical checkup, a spokesman said. Chhime R. Chhoekyapa called the surgery "a simple, routine procedure." The Nobel Prize-winning Buddhist elder, seen by many as the embodiment of Tibet's struggle for more freedom in China, was hospitalized in New Delhi on Thursday. He had arrived in New Delhi earlier in the week for a checkup, his second in as many months, and aides said afterward that the 73-year-old had been cleared to resume foreign travels. 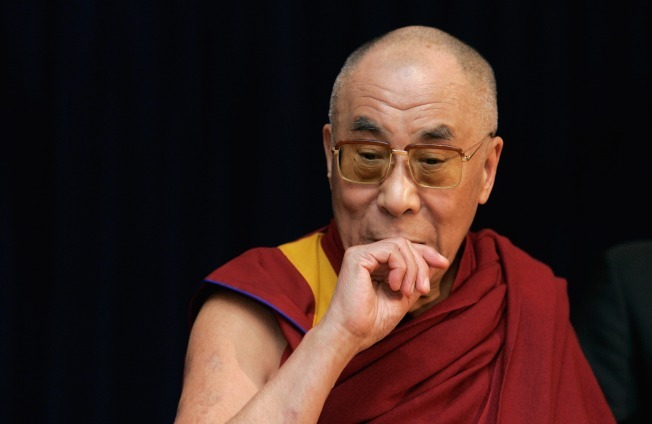 In August, the 73-year-old Dalai Lama was admitted to a Mumbai hospital and underwent tests for abdominal discomfort. His aides said then he was in good condition but doctors advised him to cancel a planned trip to Europe and rest, saying he was suffering from exhaustion. The Dalai Lama normally spends several months a year traveling the world to teach Buddhism and highlight the Tibetan struggle. He lives in the north Indian hill town of Dharmsala, where he set up his government-in-exile after fleeing Tibet following a failed 1959 uprising against Chinese rule. He was originally scheduled to return to Dharmsala on Thursday. News of the surgery sparked worries in Dharmsala, where the Dalai Lama remains the central figure — both spiritually and politically — for thousands of exiles. While the exile community has become increasingly divided in recent years between followers who support his pacifist approach and a bitter younger generation demanding stronger action against China, he remains deeply revered. "I have been thinking about this for a long time. He is 73 and will not always be around," said Tenzin Ngodup, a 28-year-old exile who escaped from Tibet into India in 1997. "What would happen to us when he is not around? I get very worried. People in Tibet have a lot of hope and faith that since he is here, something good will happen in Tibet. If the Dalai Lama goes, they will lose all hope." After a March outbreak of violence in Tibet, China stepped up its campaign to vilify the Dalai Lama, blaming him for the unrest, which Beijing says was part of a campaign to split the Himalayan region from the rest of China.